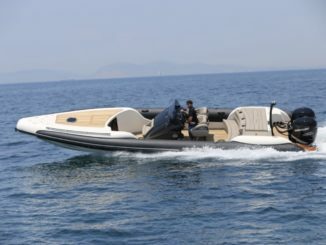 The RIB is a very popular kind of boat in Europe and all around the world but not really in the USA, where people consider it only as a tender. However, today the RIB is really more than just a tender. 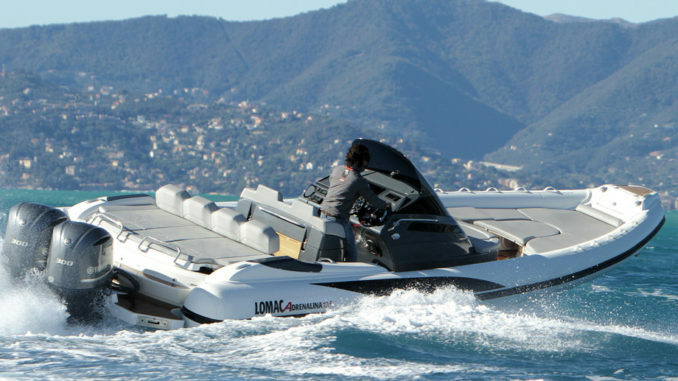 It is a safe, family and sporty boat as this 31 foot Adrenalina from Lomac shows. Lomac is one of the most famous shipyards for the RIB. The Italian company has been on the market for more than 50 years and divers, rescue teams, fishermen and family consider this brand as a reference. 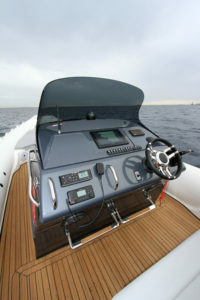 The range is organized with 7 series and 58 models from the professional grade to luxury and family boats. 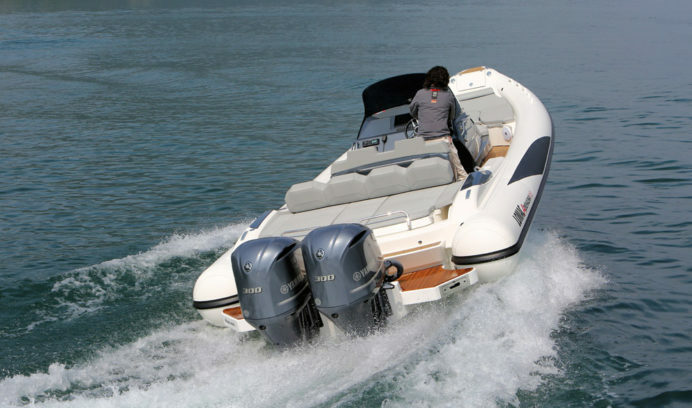 The Adrenalina series offers an open concept with a center console and a small cabin. This series includes 7 models from 22’ to 31’ and the 10.5 is the biggest with 31’5’’ of length. The design is very sporty with a sharp bow and a very wide rear part (11’5’’) which offers a very large sunbath (5’2’’ x 7’2’’- 1,60 x 2,20 m). This characteristic is also an advantage for stability. 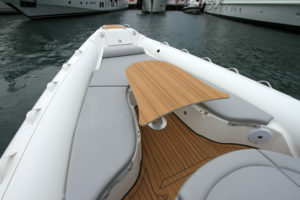 The bow is topped with a counter-molding with a small flat teak part. On the rear, the polyester stays discreet and the very sporty looking console offers a sober and modern dark paint. The motors are mounted on brackets, which allow lengthening a little, while offering two beautiful bathing platforms with a superb bath scale delivered in standard. 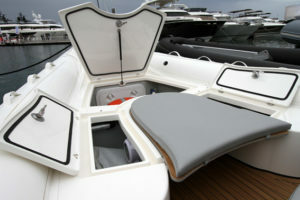 The rest of the boat is quite sober, including a quite practical large rear solarium with a foldable backrest. Echoing the first, the front sunbath does not have much to offer (4’9’’ x 6’5’’ – 1.50 x 2 m) and it can turn into a friendly picnic area with a central table. You can even opt for an electric table. The front of the console is extended by a seat that advantageously completes this space. On the front, as on the back, these tanning areas hide beautiful storage compartments. 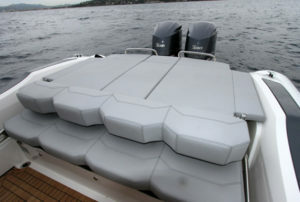 On the stern, the entire rear part opens electronically, with two large cylinders to give access to a huge storage space. 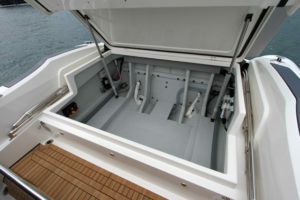 We also appreciate the storage for the bimini around the solarium. To complete this rear space, the leaning-post includes on the back an outdoor kitchen with a sink, a stove, a cooler and a foldable teak table, a real family boat. Finally, the whole front part of the console opens to give access to a small cabin. 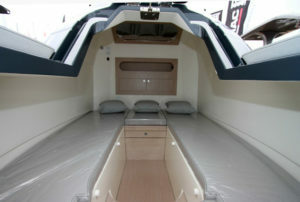 Unlike the GT model, this is a day boat so the space in this cabin is naturally limited. There is still enough room for a double bed and a location for the toilet but once the door is closed, it is better not to be claustrophobic. On the other hand, the console offers an ergonomic driving position with footrests and controls that fall well in hand. There are also switches in the central position and enough room for a large electronic screen. There are handrails everywhere and the windshield is not only well designed but also very efficient to protect the crew. The Adrenalina 10.5 is without contest a sporty boat; even more when we turn the key to start the engines. This boat is approved up to 2 x 400 hp … nothing less but the day of our test, we had « only » 2 x 300 hp, an already substantial power for the 5 511 lbs of the boat even if the Lomac supports this power easily. The bracket mount and the famous Twinshell hull from Lomac offer undeniable results. Once the mechanics is at temperature, you just have to push the handle a little bit to get kicked behind. 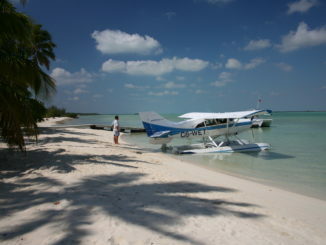 The time to plane is a formality (3.79 sec) and then, it goes fast, very fast. To reach 25 mph, you do not need more than 3.21 seconds (before the planning exit) and you can we reach 35 mph in just 5.7 seconds. At 4000 rpm the boat pop to 42 mph and the game ends at 6000 rpm with almost 65 mph displayed on the GPS, but the hull was getting a little dirty… In short, the Adrenalina (Adrenaline in English) has an appropriate name and do not believe that this boat is just for the straight line. In curves, the grip is perfect, the radius of gyration excellent and at the end of the turn you feel again a little kick in the back. 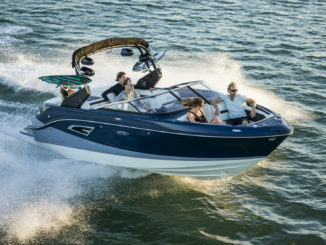 In the waves, it’s even better because the Lomac has no care of the waves and it would even take advantage of this relief to air its hull and take a little speed. However, this boat does not forget the passengers and particularly the family. Apart from having athlete performances, the 10.5 offers the comfort of a Pullman both at the cockpit and on the seats. 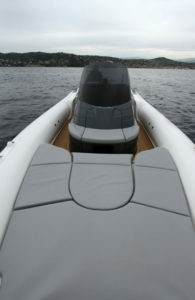 Of course, such power is not necessary and, although the boat weighs 5,511 lbs, 2 x 250 hp it should go like a dream! Finally, regarding the building, we don’t have anything to complain about. The boat is well made and the decoration has a good Italian taste. Maybe Lomac could make an effort with the equipment, for example offering the outdoor kitchen in standard. Once again, driving the Adrenalina is a real moment of pleasure. Incisive, precise, stable, catchy and comfortable, this boat offers an excellent level of sailing experience. Moreover, the manufacturing is very convincing. 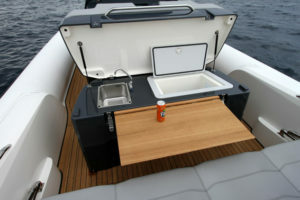 The boat is largely customizable and the small cabin offers a real plus.